This is the best programme we have ever had for teaching assistants. It was not only effective but children gained an enthusiasm for their maths work. Updated in line with the Mathematics National Curriculum. Contact your local provider for details of training. Becoming 1stClass@Number – for children who need further support to secure the Early Learning Goal for Number. New from January 2018. 1stClass@Number 1 – for children who need further support at the level of the Year 1 curriculum. 1stClass@Number 2 – for children who need further support at the level of the Year 2 curriculum. For information on Games@Home, a pack of 5 mathematical games linked to 1stClass@Number 1 that parents can play with their children, please click here. 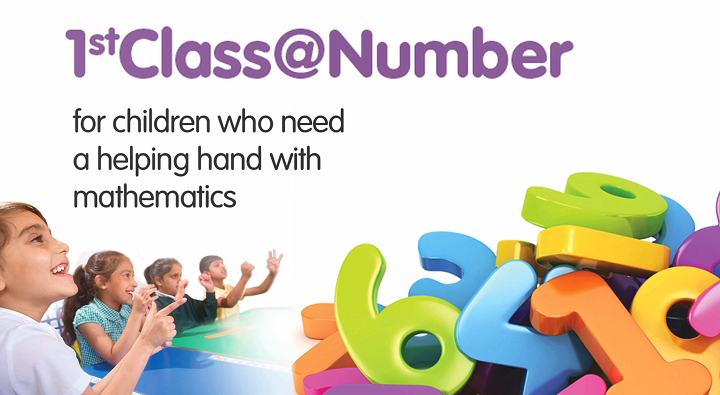 1stClass@Number comes ready-made with detailed session guidance and extensive resources. A specially trained teaching assistant delivers up to 30 half-hour sessions to a group of up to four children, for 10 -15 weeks. The children continue to take part in their normal class mathematics lessons. The lessons focus on number and calculation, developing children’s mathematical understanding, communication and reasoning skills. Stimulating, enjoyable games and activities engage the children and build their confidence. Each topic starts with a simple assessment that helps the teaching assistant to tailor sessions to the children’s needs. The teaching assistant starts working with their group of pupils straight after the first training day. Then the training runs alongside the implementation of the teaching programme, so that the Teaching Assistant is trained topic by topic. See an example lesson plan from 1stClass@Number 1 click here. See an example lesson plan from 1stClass@Number 2 click here. Over 55,000 pupils in Years 1 to 11 have been supported by 1stClass@Number in 4,000 schools. They made an average Number Age gain of 13 months in only 4 months – over 3 times the expected progress. 93% of them showed more confidence and interest in learning mathematics in class after 1stClass@Number. 1stClass@Number has made a remarkable difference, not only for our pupils but also for our TAs. The high-quality training helped our TAs to become much more confident with mathematics – not just in delivering the intervention but also in supporting class mathematics teaching. Extensive ready-made resources that are organised for you topic by topic. Access to the ECC data system, providing detailed analyses of impact and children’s progress. See sample reports here. A Games@Home parent pack is available for 1stClass@Number. Read about it here. Each local provider determines their own charges to schools depending on local circumstances. The charge for 2018/19 for a new 1stClass@Number teaching assistant, with their Link Teacher, will be in the region of £990. Schools can access 1stClass@Number from local ECC providers. Click here to find your nearest provider. How can schools prepare for and manage 1stClass@Number? Download guidance on preparing for Becoming 1stClass@Number before your staff start the training. Download a flyer about 1stClass@Number.